Save Versus All Wands: 1e Tunnels & Trolls, Part 13: Where Did All the Equipment Go? 1e Tunnels & Trolls, Part 13: Where Did All the Equipment Go? 22. Where Did All the Equipment Go? 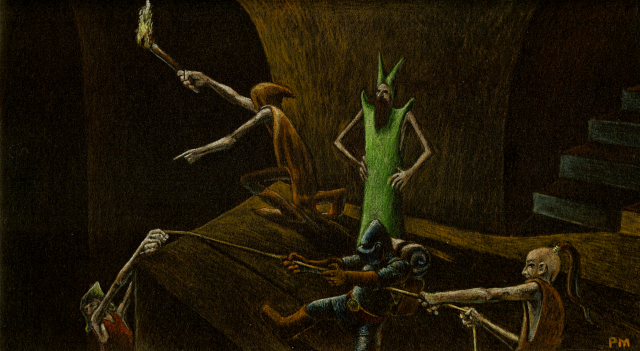 That early Tunnels & Trolls skimped so much on dungeoneering equipment, while going hyper on additional weapons and armor is another example of an area in which T&T did not try to emulate Dungeons & Dragons. My guess, and it's only a guess, is that Ken St. Andre felt that too many equipment options slowed down character creation. 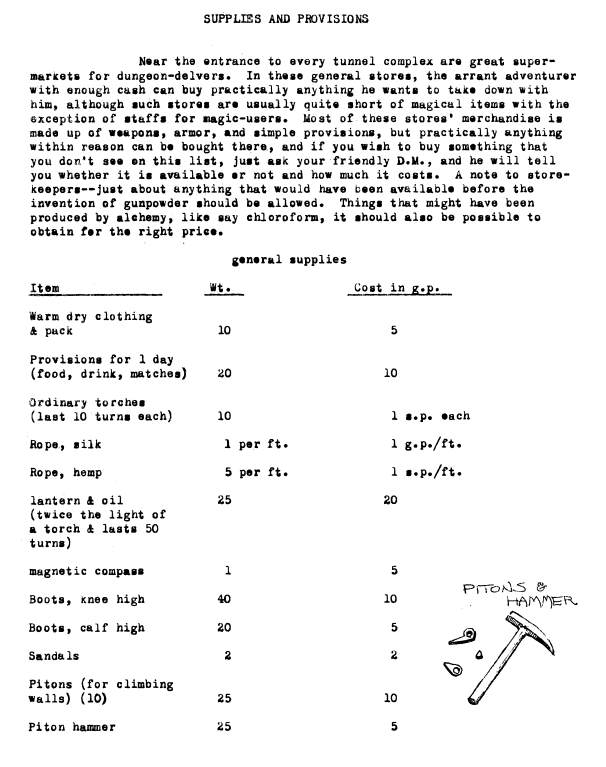 It's true that the author explicitly stated that many more things were available than what was on the formal list. At the same time, one assumes that that was not an implicit invitation for players to negotiate with the DM about buying everything under the sun. That would presumably take up even more time than just giving players a longer list. So, I also have a feeling that, overall, T&T put a bit less emphasis on exploration, resource management and the art and science of dungeoneering than many have ascribed to OD&D, or at least than many have ascribed to OD&D as "ideally" played. That's simpler. Whether it's simpler in a good way or a bad way is up to you. I admit that I'm a bit more sympathetic to the ideal OD&D conception here. I also think early T&T missed an opportunity to give a bit more flavor to its world. It's not that big a deal, but still. 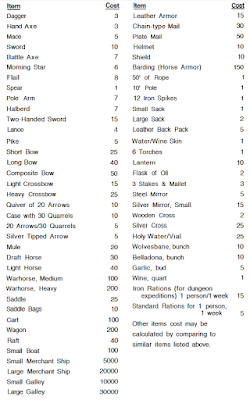 What's the point of an equipment list in a fantasy game? Well, one point, obviously, is to list what equipment the player-characters can have - and, thus, to implicitly indicate what the player-characters can do. But the other equally, if not more important purpose, is to give the reader or player information about what the fantasy world is like, conforming to the principle of showing not telling. What does one learn from such a list? It's a quasi-medieval-type world with medieval-type weapons and armor (ignore that some of the weapons and armor aren't medieval exactly but more renaissance or even post-). Even so, this somewhat primitive world still has different gradations or variations of technology - different makes of bows and crossbows, for example. 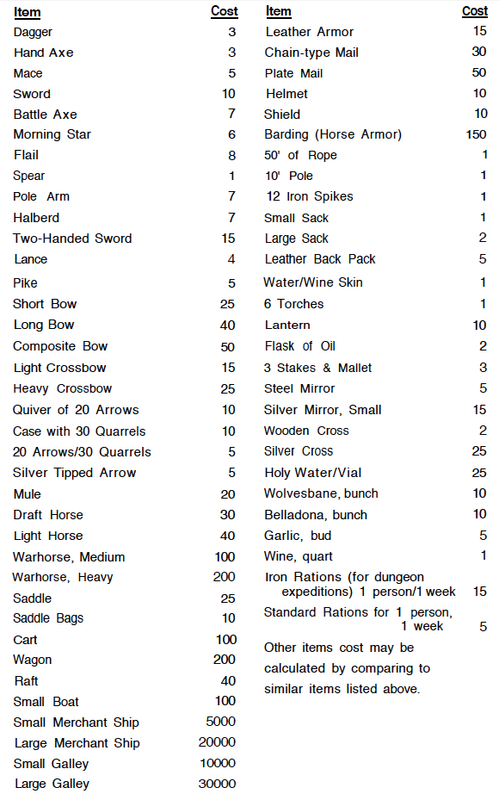 Resource management and accounting is fairly fine-grained - with costs given for arrows, torches, flasks of oil, etc. 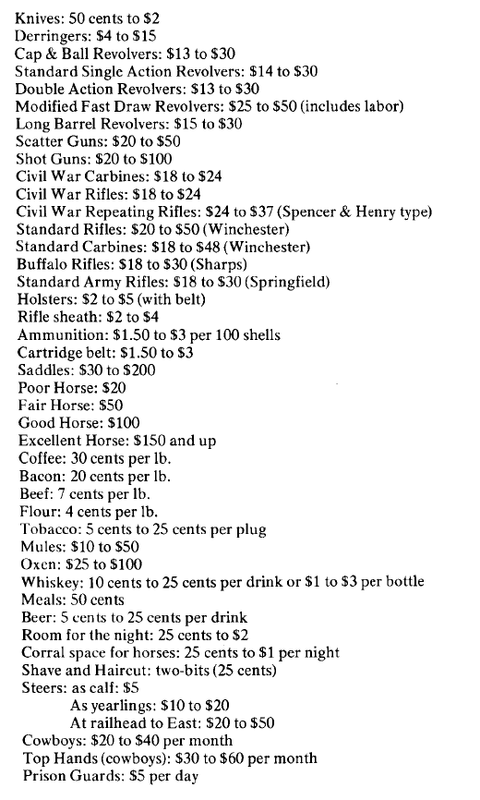 There are horses and other items of land transportation available. The game is not all about exploring dungeons. Some adventures may take place on the sea, and wealthy adventurers will often own ships. Careful exploration, maneuvering and tactics in dungeons is recommended - there is a 10'pole, rope and spikes. 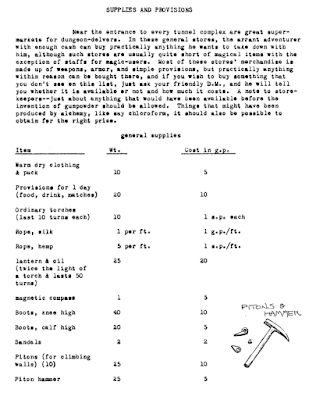 Adventurers are encouraged to plan for carrying things - perhaps treasure - out of the dungeon. Dungeons are probably dark. One needs to bring artificial light. There's a lot of supernatural, holy items vs. vampires and werewolves stuff going on. Poison might sometimes come in handy. 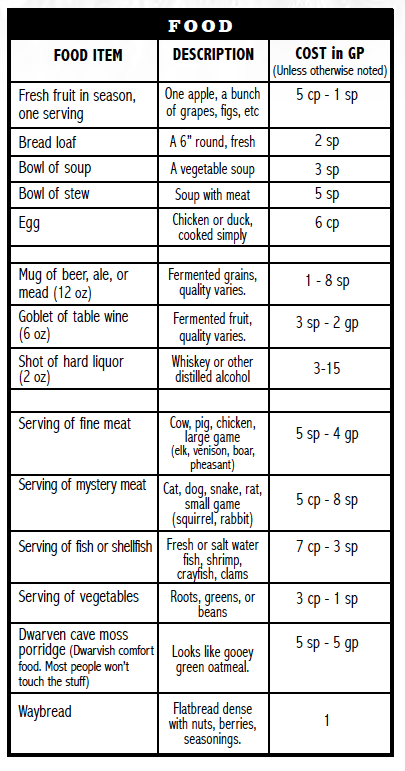 Adventures are often multi-day expeditions that require "rations." 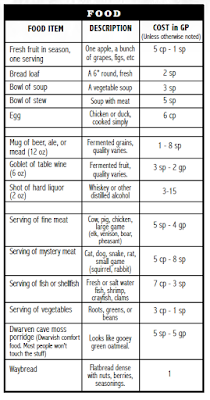 But dungeons are in some sense tougher (though, it's not clear precisely how), requiring tougher rations. If all of this seems obvious or superfluous or whatever (you already knew it), remember that you didn't already know it in 1974. Some of these things would be elaborated on or explained elsewhere in the rules, but many of them wouldn't be. To a great extent, this simple list encapsulates much of what we have come to know and accept about Dungeons & Dragons and other similar games, including Tunnels & Trolls. In my view, a one page list is ideal to give you a sense of the world and the place of player-characters in it. Some fantasy games (including subsequent editions of D&D) would go on to offer expanded lists. These often amounted to pointless bloat, adding little to game play or the picture of the world portrayed. There are are, however, exceptions. 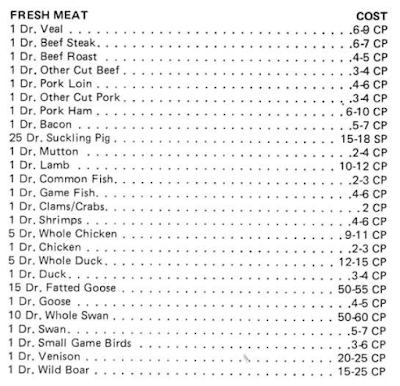 Note how similar this actually is to the OD&D list. But the simple inclusion of "Chlén-hide" (which an awful lot of things seem to be made out of) and "Chlén beasts," among other things, lends it an exotic air. After all, while Dungeons & Dragons was about "Fantastic Medieval Wargames Campaigns," Empire of the Petal Throne was about "Rules for Fantasy Adventures and Campaigns on an Alien Planet." Guess what that game is about and what you might be doing in it? The letter-bomb detector alone tells you five different things about that world and the (now you know) not all-powerful by any means "superheroes" that inhabit it. I said that fantasy games would soon start to show equipment bloat. 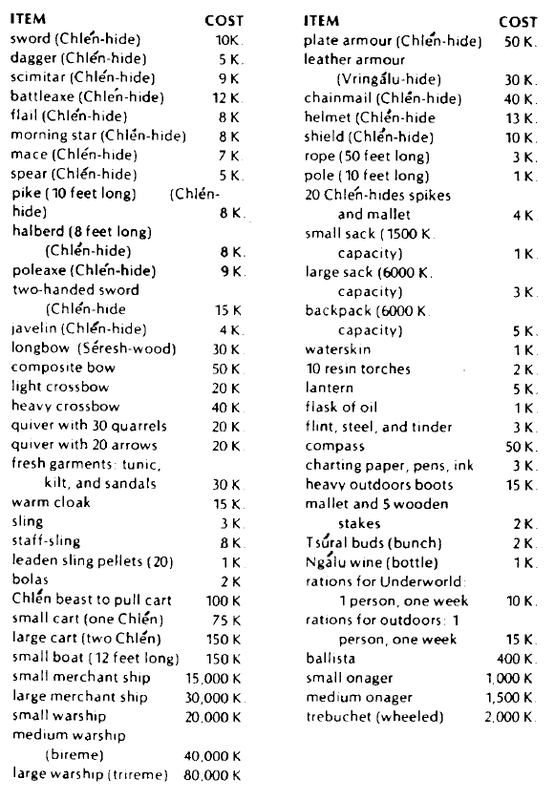 The expanded Advanced Dungeons & Dragons lists are a good example of that. 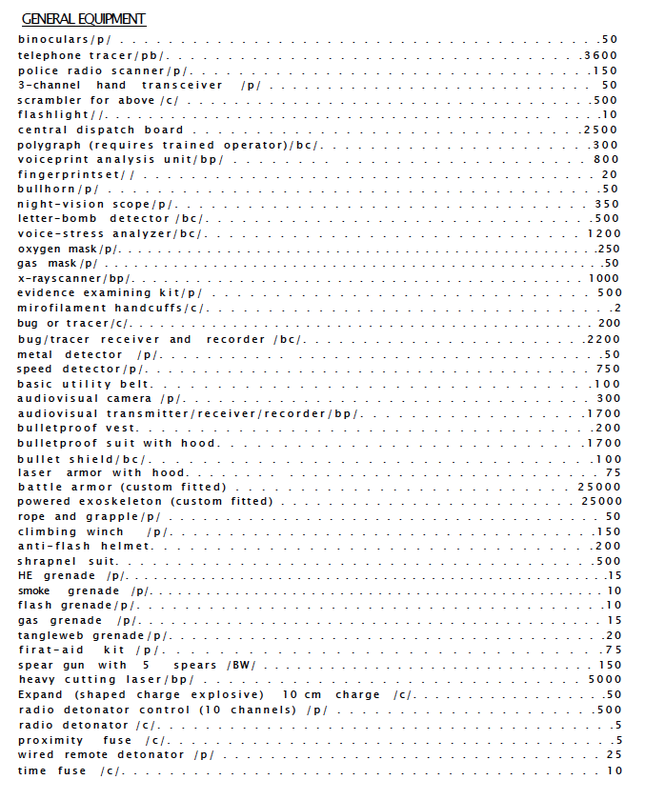 The numbingly comprehensive "netbook" items lists developed by D&D fans during the 3E era are another. 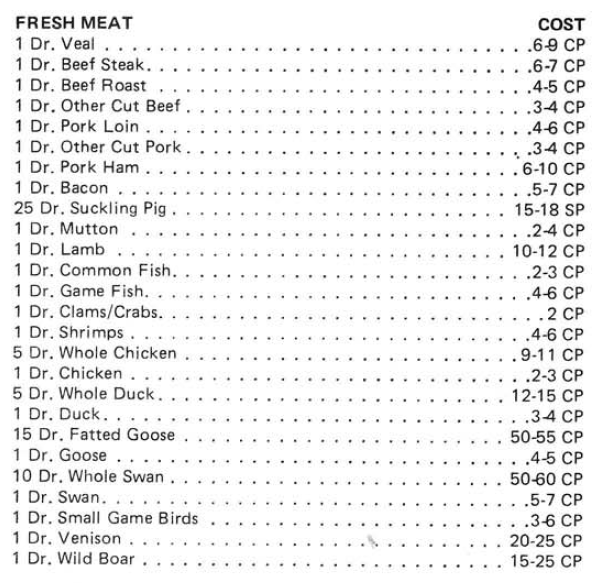 In my view, once you find yourself with so many items that you must divide them into sections with separate headings - Transportation, Fine Dining, Women's Hosiery - that's probably a bad sign. But occasionally such excursions are justified. Do you want an authentic medieval experience? Well, that's up to you. But if you do, the items list of Chivalry & Sorcery practically trumpets (or bleats or quacks) it out. There's nothing like a Whole Swan after a successful day of dungeoneering. Or chivalry. 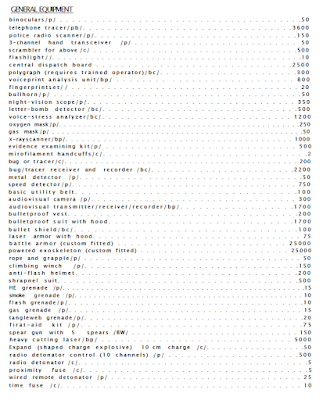 So, in my view, equipment lists are a great opportunity to show (rather than tell) more about a game and its world. Early T&T somewhat squandered the opportunity. But so did others. 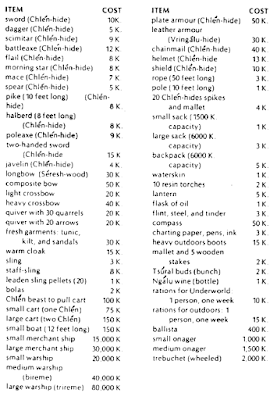 Traveller (1977) had a nice set of item descriptions but no easily viewed list, somewhat lessening the impact. Runequest (1978), a game heavy on atmosphere but (in my opinion) tedious to play, pretty much punted its chance with a largely generic list. 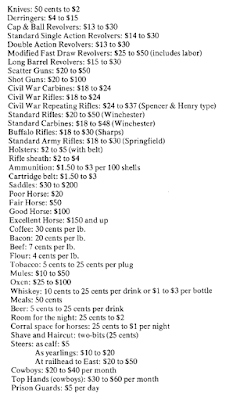 I don't need to know what the modern T&T price of bread is. But I love knowing that Dwarven cave moss porridge is available, as well as the fact that it's "Dwarvish comfort food, most people wouldn't touch the stuff" and it "Looks like gooey green oatmeal." That says Tunnels & Trolls to me.